Spring is nearly here and the annual plant and tree sales are ready for you! Whatcom Farm Forestry Tree Sale: Saturday, March 17 from 10 a.m. to noon at the Northwest Washington Fairgrounds in Lynden. A variety of trees are available for $1 each, including: Mugho Pine, Fraser Fir, Sitka Spruce, Deodar Cedar, Giant Sequoia, Western Hemlock, Noble Fir, Incense Cedar, Norway Spruce, Grand Fir, Ponderosa Pine, Western Red Cedar, Colorado Blue Spruce, Concolor Fir, and Douglas Fir. For more information or to place a large order, contact whatcom@wafarmforestry.com or call 360-733-5931. 11th Annual ‘Rite of Spring’ Seed Exchange: Due to weather conditions, the seed exchange at the Van Zandt Hall was postponed until Sunday, March 18, 2-4 p.m. Hosted by South Fork Valley Community Association and Local Food Works, all are welcome to come share seeds, plants, bulbs and gardening tips at this free, family-friendly event. No seeds to share, no problem. The Van Zandt Hall is located at 4106 State Route 9 near Potter Road in Van Zandt. 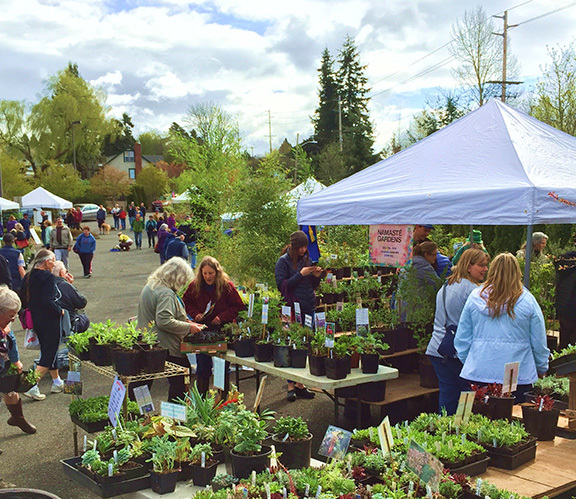 Whatcom Conservation District Annual Native Plant Sale: Low cost, native plants will be available to the residents and visitors of Whatcom County on Saturday, March 24 from 9 a.m. to 2 p.m. at Whatcom Community College in Bellingham. Roughly 40 species of native, bare-root, conservation grade trees and shrubs plus potted perennials will be offered at great prices. Local specialty nurseries participate and sell additional native and other unique species. Local vendors and community groups also on site. Come see the new mobile Watershed Explorer in action. For more details, see whatcomcd.org/plant-sale or the Facebook event. 30th annual Fairhaven Plant and Tree Sale: Saturday, March 31 at the Hillcrest Chapel outdoor parking lot (corner of Old Fairhaven Parkway and 14th St.) from 10 a.m. to 3 p.m. This one-day extravaganza offers shoppers the chance to purchase plants and other garden items from local and regional growers. Perennials, specialty grasses, ornamentals, trees, native plants, herbs, berries, bamboo, metal art, and much more will be available. Please check event Facebook page for an updated vendor list closer to the day of the event. Vendors donate a portion of sales to Fairhaven Neighbors, which in turn uses proceeds for neighborhood projects such as the Fairhaven Community Garden, and to help support other local non-profits. Previous beneficiaries have also included Skookum Kids, Whatcom Hospice and Sean Humphrey House. For more information, see Facebook.com/FairhavenPlantAndTreeSale or contact Lisa Heisey at 360-220-4747. 2018 Skagit Conservation District Plant Sale: Saturday, April 14 from 9 a.m. to 1 p.m. at WACD Lynn Brown Materials Center, 16564 Bradley Road in Bow. Large selection of native plants available for good prices. Pre-order pick up Friday, April 14. For more details, see http://www.skagitcd.org/native_plant_sales. Whatcom County Dahlia Society Tuber Sale: Saturday, April 7. Explore and buy over 600 varieties of dahlias, and visit with local, knowledgable growers. Free entry, 10 a.m. to 3 p.m. at Bloedel Donovan Park in Bellingham. See whatcomcountydahliasociety.org. To share plant sale event dates please send information to editor@grownorthwest.com. Additional dates will be posted online.